Daily Bible Verse 101: I have sinned against the Lord. I have sinned against the Lord. "You have despised me and have taken the wife of Uriah the Hittite to be your wife." (2 Samuel 12: 10).
" 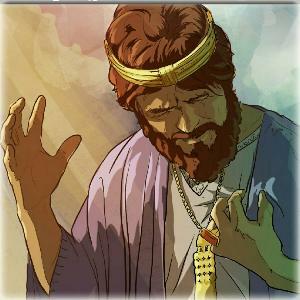 Then David said to Nathan, “I have sinned against the Lord.” Nathan answered David: “For his part, the Lord has removed your sin. You shall not die, but since you have utterly spurned the Lord by this deed, the child born to you will surely die.” (2 Samuel 12: 13-14). Here is David at his very best. No pretenses. No excuses. "I have sinned against the Lord." renew within me a steadfast spirit. Do not drive me from before your face, nor take from me your holy spirit. Restore to me the gladness of your salvation; uphold me with a willing spirit. I will teach the wicked your ways, that sinners may return to you." (Psalm 51: 12 - 15). Psalm 51 is the best and greatest prayer of repentance. It was good for David. It has been good for kings and queens, princes and princesses, soldiers and common people throughout the centuries. God still listens to it with delight. What is this new teaching with authority? Forever I shall maintain my mercy for David. A Kingdom divided against itself cannot stand.